I love these Airmail retro postcards. They look like they were done with a letterpress. Such a cool way to have people save your wedding date! About to embark on the grandest adventure of all time? Well then, Congratulations! 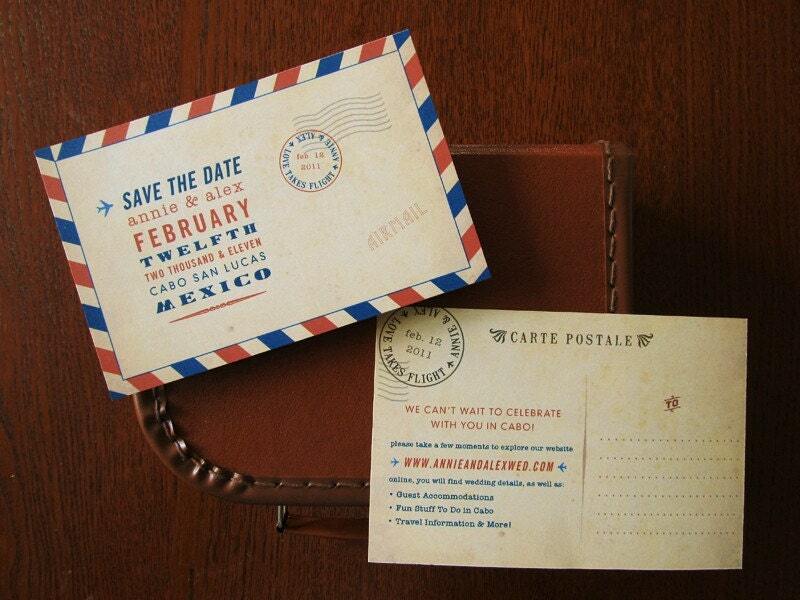 These unique and extraordinary Vintage Airmail style Save the Date Postcards are sure to get your guests excited from the very start! They will be intrigued and excited to be a part of such a unique celebration! 110lb Cover Semi-Smooth Paper in a Natural White, also available in White. Double-sided printing with space on the back to write out your guests addresses with ease! Fun and Functional! By EARMARK - it's an Etsy store, so you're helping an individual (not a corporation) which is nice.